Background: 2005 Chrysler Grand Voyager 2.8CRD 138,000miles, regular servicing by myself, last oil and filter change approx 2 months ago, nothing unusual. Running well, occasional rough start, occasional tough warm restarts. Unfortunately my trouble-free running has come to an abrupt ending. After doing some heavy miles over the past few weeks (1,000 in a week, 400 in a day, motorway constant running) we went for a 40 minute journey today. Going up several hills working the car hard accelerating up the hill, all still fine. On the last hill, halfway up the temperature started to go up, my temperature gauge is always rock solid on half, even sat in long traffic, etc, it rarely goes a notch above. Today it went a notch or two above, still below what I'd say was 10-to (the hr), I put this down to the long uphill. As we approached the top of the hill I got an oil pressure light flicker several times. I eased right off and was then coasting slightly downhill, temperature went down and the oil light went back out. I pulled over (oil pressure flickered again) and shutdown. Checked oil dipstick and oil levels were normal, midway all the way, nothing else unusual, no oil marking, no oil drops, etc. Oil filler cap was clean, no creaming or other issues. Gently opening water, same there, usual level in expansion bottle (halfway), no oil film or anything else. Nothing else unusual at all. I started back up, it laboured a little to start and was chugging somewhat, bit of a knock, revs seeked a little at idle then settled, oil pressure light went off. I drove a bit further, after about 10 minutes, again after a slight incline oil pressure light flickered on, stayed on then went out again, again temperature rose slightly, and started to get a hammer-like noise, directly linked to revs. So I pulled back over and total stop. Again no other signs. Towed it to my parents which is where it's sat now. We've taken the aux and steering pump belts off to eliminate them (Noisy bearings on alternator at the minute). We've just done another injector leak-off test, very little fuel leaked out the injectors so again these seem all OK.
No lack of oil, water, mixing or change to fluids at all. Engine can be cranked manually via the pulley and it turns as normal (feeling the pressurisation, release, etc). Starting it up and idling, it starts and runs, again hammer-like noise but not very prominent at idle, increase revs even slightly and you get a prominent hammer/tappety-like noise. No oil warning lights. Have listened as much as possible to all parts of the engine, top rockers, injectors, bottom end, bell housing, etc, and cannot positively identify location of noise. So now at a loss what to do next, whether worth proceeding as the potential issue from our thinking is loss of oil pressure due to bearings worn, big end, so a serious amount of garage time/effort to diagnose and potentially replace. Opinions and thoughts welcomed as always please folks! When was the antifreeze/anticorrosive last changed? HOAT anti freeze (as used with an aluminum radiator) has only a certain life, abs. max 5 years, more oft 3 years. 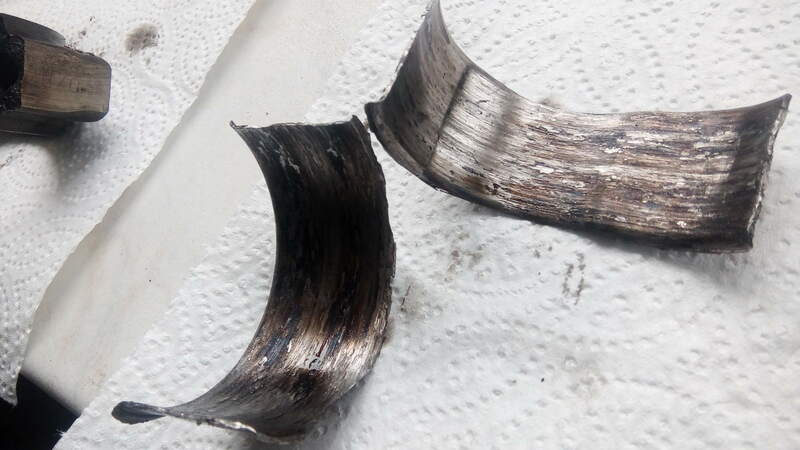 This because some parts of the engine are iron and some aluminum, and together with conductive coolant acting like an electrolyte, corroding the aluminum radiator. HOAT antifreeze MUST be changed on time, as I know to my cost. These rads cannot be flushed. Also the thermostat will jam wide open as it is designed to, resulting inj more cost and time, unless you read my article of some years ago. Are the electric fans working when the engine gets really hot? Is the rad blocked with flies, bugs etc? There must be something seriously wrong when a diesel engine overheats since they only make about half the heat of a petrol, hence the fuel-efficiency. If you have followed the above, you will be able to drain the rad. reasonably quickly so you can blow thru' it with ease. If there seems to be obvious resistance, guess what. I'm not suspecting the overheat as the mega cause here, more the oil pressure/lack of oil flow which I think in turn has caused another failure. Keeping at it, so far have dropped the pan and there aren't any bits in there. Next step is to remove the balance shaft assembly and take a look at plan on the crank, also to check the oil seals on the balance shaft and also the oil pickup pipe. Well, not wanting to leave an open end, the conclusion is that it's getting carried away to the scrappy sometime later this week (Giving me £80 for it, including pickup). Unfortunately when we dropped the sump, balance shaft assembly and oil pickup (Oil pickup O-rings were spot on) we felt rattle on cylinder 2 big end. Took it apart and WOW we found an amazing failure. Dropped the lower piece off, and NOTHING, no bearing at all, it had become sandwiched against the crank. So prising that off and it was in a bad state. What was worse was the upper bearing that had semi-welded itself to the crank. As you can imagine the crankshaft itself didn't look healthy, so being realistic it would be crank out, sand/grind it smooth then replace bearings with additional mm thickness. Way too much for me and my dad to attempt and too costly for a garage really. And so, that means it's the end of my CGV, I've taken a few parts off it so firstly - ANYONE WANT PARTS? Let me know ASAP and we'll come to some agreement. I'll still lurk the forums as love the cars and everyone here, so you've not got rid of me, but I doubt I'll be getting another CGV now as just don't need the room, or headaches on the older higher mileage. Mine did 138,465 on the clock and interior and external were still amazingly good for a 2004/2005 model. Sorry to hear of the demise in the heart of the motor, that can be a very large expense to repair or even swap out the motor for another! good luck to you in what you end up getting for new wheels! Cheers guys. Yeah it's not an easy fix, either way it's an engine out to sort the crank really to be confident in the repair work, unfortunately I think it's time is up, so I've been pulling bits off it, am I buggery going to send it to a cheap scrapper with injectors, etc in it! @goggs cheers fella, I know, I'm going to miss it like crazy but my job now means travelling at least 45 mins a day so need reliability so going to buy a typical runner I'm afraid. Yes indeed Andy B, these G.V.s do grow on you after a while, and I've often wondered how an engine with only 150 horse manages to push nearly two and a half tons of vehicle around the way it does, esp. from the lights. Mine has been quite reliable after I fixed the "neglect faults" from the previous owner, but then I don't use it much. But nowadays there does seem to be a big choice of very similar motors, so best of luck with the new one. Mine was mounted UNDER the vehicle inbetween the two front seats. I hope no-one gets a puncture in the dark and it raining. It was a pig to get out and took all morning. Fortunately I did it at home, so there was no urgency. But I'd like to pass on a handy tip to our millions of readers. @ AndyB: Sorry to see you go Andy, your help has been invaluable to me, especially regarding fitting the new head unit and rewiring the speakers etc. Incidentally, just got back from a 3 week holiday during which time my GV was sat on the drive without moving. On my return I expected the battery to be flat but it started without any problem whatsoever. I do believe that the factory fitted amp has been the cause of all my battery problems, good riddance. @ Leedsman: Good tip about relocating the spare but I've never found it too much of a hassle removing/replacing it when checking prior to a long journey. A small cordless drill can make the job a lot easier and quicker. 99 T&C w/3.3 engine possible to fit 3.8 engine?